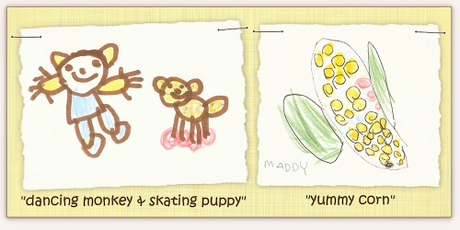 11 posts categorized "Maddy Art"
Maddy has always had amazing attention to detail and the patience to sit and perform a task over and over and over again without ever getting bored. She takes instruction well (as long as there's no hint of criticism) and loves to learn new things. Her newest 'most favorite' thing is drawing and she's made incredible improvement in just a few short weeks. During that time, she's gone through a ream of computer paper and two sketch books! At first, she would draw shapes then simple faces with arms and legs sprouting directly from her subject's head. Last weekend, she learned to give her people and animals an actual body and she's now adding details like fingers and shoes. She pretty consistently gives everybody five fingers on each hand and I can't help but smile when I notice that she always gives her animals five legs (but only four skates?). Yes, her puppy has skates! She loves fruit and veggies so those are often featured in her artwork. She proudly signs her name to each of her masterpieces. Her picture of corn on the cob makes me hungry! Maddy had her Pre-Op appointment today so everything is all set for her surgery next week. She doesn't know anything about it and she's such a little worrier that we think it would be cruel to tell her anything until the absolute last minute. Blood work proved that both of our kids had false shot records from China. It took two years to bring them up to date on their immunizations and Gwen had a one year head start. This meant Maddy spent the last year getting shots when Gwen didn't have to get any and I'm sure that made each shot hurt even more! This time, it's not just a shot and a bandaide and she's in for a pretty uncomfortable experience. But she doesn't know what surgery is so she hasn't put us on the spot to come clean about what will happen to her. We're letting her appreciate the blissful benefits of being ignorant this one last time. Like any parent, I'm anxious about the surgery but I'm also filled with dread in anticipation of the moment we have to explain the IV. It breaks my heart when my babies are scared. So, she'll have her cleft palate repair next week and they'll put tubes in her ears at the same time. To our surprise, her hearing test came back less than perfect and they think the tubes will correct this. I think her hearing is better than the test results showed because this child seems to have bionic ears. She can hear the faint meow of our Kitty when she gets locked in the closet on the other side of the house. And, of course, she can hear the word "chocolate" even if it's uttered from another time zone! To my shock, the ENT clinic told us to be sure to bring our adoption papers on the day of surgery. I'm going to tuck her California Birth Cert in my purse but heaven help the person who asks me for it because I think it's racial discrimination to make us provide this proof simply because our children don't look like us. What about the bio kids who happen to be Caucasian but don't look like their parents? What about adopted kids who look like their parents only because they happen to match, racially? Somehow, I doubt those parents are being forced to prove that they didn't just drag some random child in off the street and try to con the hospital into providing surgery by passing them off as one of their "real" children on the health insurance card. Since I tend to give everyone the benefit of the doubt that no offense is usually intended, I don't normally get upset about this stuff. In every other instance, I'm delighted when people notice that my beautiful baby girls have Chinese faces. I love their faces; their silky honey colored skin, their sparkling almond shaped eyes, their glossy dark brown hair. They're my children -- they're mine! But even more importantly, I belong to them -- I am theirs. If someone questions the validity of that relationship, it makes me very defensive because my children have become healthy and whole only by coming to depend on the safety, security and love they've found inside my arms (and Daddy's arms). Unlike the other 99.9% of kids the hospital admits each month, my kids didn't have the benefit of this bond from birth so requiring us to produce a piece of paper that other parents don't have to produce makes me feel uncomfortable. I can't quite put my finger on it but it's a mix of sadness and anger. It just seems so unfair. But, since my Maddy is little and doesn't understand enough about any of this to share my discomfort, I'll produce the stupid "proof" that the cute Chinese kid belongs to me. But I won't promise that I'll keep my mouth shut as I'm handing it over.